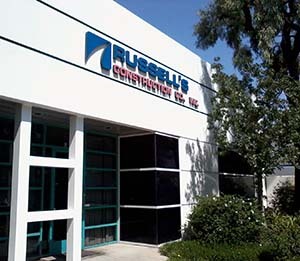 Founded in 1979, Russell's Construction started out as a small parking lot striping business. Parking lot striping grew into parking lot construction and maintenance, and now the rest is history. Today we are a diverse, successful construction company providing a full array of grading, paving, concrete, fencing, and landscape construction services. We are a "B" and "C-12" licensed (Lic. #576578) and insurance construction company, experienced in services from asphalt paving and patching, grading, concrete, maintenance repair work, demolition, pavement markings, masonry repair, complete TI, remodeling, and new construction. We have worked with a large number of general contractors, property management companies, and private owners throughout California. Site by ClearWest | Copyright © 2013 Russell's Construction Co., Inc.